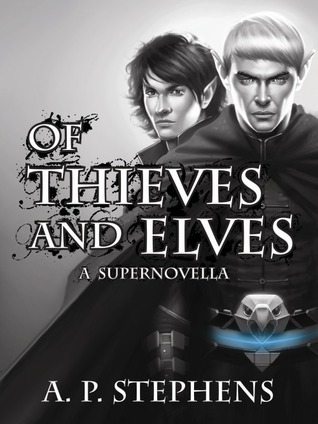 I received Of Thieves and Elves as a review request from the author AP Stephens a while ago. When starting the book, I didn’t really know what it was about. I knew it was classified as epic fantasy and that was about it. Since reading the book, I have found that Mr. Stephens is known for the epic fantasy genre and he has a reputation for excellence in his work. I would have to agree. Initially, I had a little bit of trouble getting into the book. The beginning is a little slow moving but once the adventure of the tale starts, it really takes off and goes non-stop until the end. The characters are all very likable and although they’re fantasy creatures, they are easy to relate to. In their own setting, they are challenged with very human issues. As with most other epic fantasy, loyalty is a key theme. Not having read any of his other work, I can tell you that this book is descriptive enough that you do not feel at a loss for not having familiarity with the world Mr. Stephens has created prior to picking up Of Thieves and Elves. True to the greats of the epic fantasy genre, Of Thieves and Elves is wordy. So if you have a short attention span, you might want to meditate or do whatever it is that you do to get focused prior to picking up this book. I assure you that the effort will be worth it. Overall, I am going to give Of Thieves and Elves a solid 4 stars. Well worth the read but a little slow going in. Get over that initial hump for the action to really start and you’ll enjoy the rest of the ride. As part of his Indie Author Spotlight (his day is August 3rd), author A.P. Stephens is offering Pure Textuality readers a coupon code for his book Of Thieves and Elves. From now until August 23rd, you can get Of Thieves and Elves for just $2.00 from Smashwords. Use the coupon code SC95J when you check out to get the discounted price. CLICK HERE TO GET YOUR COPY. Smashwords carries all of the ebook formats available. Click here to purchase your hardcover copy! Click here to purchase your Kindle book copy!